Franchisors who are in a fortunate enough position to oversee a few dozen franchise locations often have much bigger fish to fry than acquiring local business reviews. It’s unfortunate because just like any other small local business, obtaining reviews online goes a long way towards establishing your presence both online and in the real world. Not only that, it helps give your search engine rankings a hefty boost, a notion supported by Moz’s local search ranking factors. Now, don’t take that the wrong way. Business reviews are pivotal boosts to a business, but the way a franchisor accomplishes this is different than a traditional business owner would. One of the most challenging parts of being a franchisor is making sure you are constantly on the same page with each of your franchisees. This requires a thorough, comprehensive infrastructure upon which the business operates as well as consistent open lines of communication. Business reviews are a byproduct of that infrastructure. It’s all about developing a plan of attack and conveying it to your trusted franchisees so they can implement each element. But, what exactly could that plan entail? The first step is simple, and it alludes to the aforementioned infrastructure. Cultivate a great customer experience. According to an American Express survey, happy customers will tell an average of nine people about their experience with your business. Before encouraging your franchisees and employees to ask customers to leave online reviews, make sure you do some research on what each review site is comfortable with. For example, Yelp discourages franchisees or businesses from soliciting for reviews because their company policy believes it jeopardizes a site’s integrity because users would see reviews as biased towards favorable ones. This makes the reviews difficult to trust. On the other hand, Google is totally on board with this practice, and actually encourages it. To each their own! It’s important to target the review platforms that are not only relevant to your industry, but also easiest for your customers to access. It cannot be stressed enough that you’ll have to look into any review source you plan on using to make sure the site encourages soliciting. It should be easy information to find across the board on any site’s terms and conditions page or FAQ page. Now, when it comes to asking for reviews, you’ll have to make sure you are targeting the right customers, i.e. the ones who are getting the most out of your product or service. These are the people who will leave you the best reviews – ones that make it very obvious who exactly your product is right for. How do you know who is getting value out of your product? Customers who are referring, promoting, and are engaged are the ones getting the value. Even better – Take the Social Media Route! Pretzelmaker is a franchise that recognizes this. They detailed in a blog post how effective social media can be for building your entire business up to the next level. “You can post customer reviews on Facebook, Twitter, Google+, and any other social media platforms you use. Your customers become your greatest advocates, both in the reviews themselves and in their sharing or commenting on your posts,” they said. That is exactly right. Each and every review is an asset to help grow your franchise. Think of how happy you get when a random person you encounter pays you a compliment. Then imagine how happy you’d get if a random person gave you a compliment and handed you $50! That’s what an online business review can do. Social media allows you to get a little creative. Don’t forget to utilize the review tab on Facebook, as well as LinkedIn recommendations, and even YouTube reviews! You might even go so far as to have a camera in your store to film customer testimonials. Another important thing to keep in mind – NEVER forget to respond to your customers. Even the bad reviews deserve responses. People who had a negative experience will appreciate that you took the time to hear them out and try to correct whatever it is that was bothering them. In order to avoid wasting your time with social media marketing for your franchise, you must keep an ear to the ground and reach out to your happy customers. You can do this by utilizing social listening tactics as outlined by Mention’s 5 minute brand monitoring plan and tracking what your audience is saying about your franchise or product. Make sure to monitor keywords concerning customers’ issues. Keep an eye out and monitor keywords saying “(franchise) can’t” do something. These are customers you can reach out to in order to fine tune your franchise’s business model. You can also listen for keywords people might use when researching a product. A tool you can use to gauge where your audience’s heads are at is AnswerThePublic.com. Social listening can be utilized in a number of other ways, such as identifying potential issues in a product’s release, finding out which social media platform is most beneficial to your business, and much more. You can convert this social listening and social media engagement into reviews by using a tool such as Mention.com after you reach out to your happy customers and ask them to leave some of their kind words in a review. The vast majority of people who browse the internet do not take time to comment. Forming positive relationships with the ones who do will help grow your business. There’s no better way to gauge what your customers are thinking than to get their opinion directly. Happy customers are the main goal of your business, so a quick survey says a lot about not only their experience, but about who you are as a franchise. Happy customers are more likely to return to your business instead of fleeing to a competitor, and are also more likely to tell friends and family about their experience. An effective satisfaction survey implements a rating scale. Ask your customers questions that require them to rate 1-10 how much they enjoyed their experience. Make sure your surveys are also easily accessible across all devices. In-store kiosks are a great way to present surveys, but some customers might be in a rush to head somewhere else. Hopefully, they would be more than happy to fill out a quick survey on their phone, tablet or computer when they get home. An all-inclusive customer satisfaction survey tool such as GetFiveStars.com will help you keep track of all your testimonials, automate the feedback process, and much more. Check it out! Just as the old fashioned birthday card is still preferred by many over a “happy birthday” text, sometimes a printed handout is more your customer’s style. If done correctly, it often has a more personal feel than simply asking for a review. This template from Synup takes care of all the legwork. It can be a lot of work actually explaining to a customer how to leave a review, where to leave it, why the review is helpful, how to create the required Google account…it’s just a lot of work sometimes. A one-page handout can take care of all of these problems. Happy customers won’t be so happy to leave you a review if it isn’t easy to do. You can take this one step further by offering incentives for customer reviews. 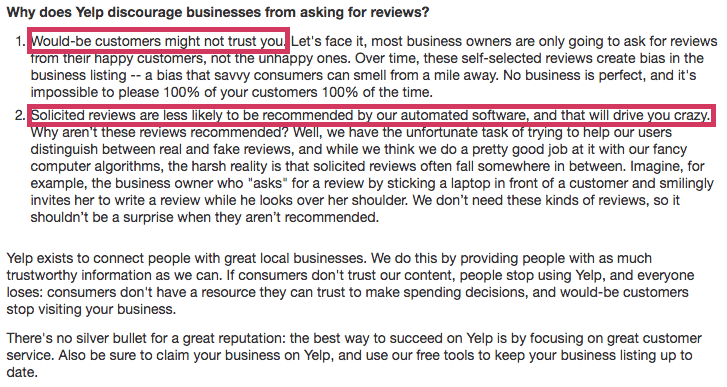 We discussed earlier in the piece about soliciting for reviews and how certain platforms aren’t comfortable with this practice, and the same rule applies for incentives (Yelp, for example, does not condone this practice whatsoever). Giving a customer who leaves a review for your business a free product or a discount is a strong way to encourage reviews without implementing any shady practices. You can also run customer contests in which a user wins a reward for leaving a review or referring others to your company. This is pivotal. No matter how many franchises a franchisor oversees, you cannot forget about a single one or make any franchisee feel slighted compared to another. Each franchise must be treated as an individual entity and not an expendable asset. It is a simple, time tested business principle that if you take care of your employees, they will take care of your customers for you. Part of being a franchisor is also adhering to specific business standards and practices associated with the franchise itself. This can often make it easy for franchisees to simply do things by the book and avoid going above and beyond. Franchise Business Review reviewed the top 5 brands for franchisee satisfaction back in 2015, and CEO Don Fox of Firehouse Subs which was ranked No. 3. had some interesting insight on this topic. Fox added that when they see a franchisee doing great work in the customer satisfaction department, he and his team will surprise the franchise location and show up to reward all the employees with thank you cards containing $50 bills. In an industry that’s so continually focused on SEO, online success, and other digital metrics, the human element can often become an afterthought. Cultivating a strong culture and working environment will drive plenty of reviews. This is not as easy to do with multiple franchisees in your network, but small gestures of faith and appreciation for your franchisees will encourage everyone at each location to go above and beyond. It’s easy as a franchisor to become encompassed in day-to-day tasks and forget about how important something like customer reviews is. They are a huge asset that doesn’t require a ton of effort. If you know you have happy customers, this is how you let the world know.